Andrew Huang makes music for every occasion, and in almost every genre imaginable. Until recently, he had all his music split into different "band names" based on what sound the music fell under. After getting an opportunity to work on a project with Emily Haines from alt/indie band Metric, which included a bit of mentoring, Huang felt like it was time to consolidate all of the projects into one, and start releasing everything under his real name (with the exception of Songs To Wear Pants To). Once his new Bandcamp page went up, he re-released four of his previous albums to support the new name change. He first re-released his Your Heart albums Summer and Autumn (adding one track to Summer), then the Your Heart album Love Songs (taking it from three songs to eight; mostly alternate renditions of other Your Heart songs). 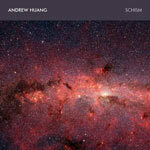 He also re-released Schism, which was previously as The Cloud. Like Love Songs, Schism also received some additional tracks, going from three songs to eleven. Of the new tracks, three are from previous releases (electro-rock song "Shy Knife" was a single he released, and the combination of "22" and "Ursula" was originally from The Cloud's EP. The Tongue). The rest are originals for the full-length Schism. "New Love" starts off with some experimental, electronic hip hop (one of Huang's specialties). Huang has a way with electronic music, so be prepared to really enjoy the music he's created here. Not to mention his rapping is usually right on target. "Shy Knife" follows, which is a little odd, as it's an electro-rock song in between two hip hop songs. However, the song still sounds good, as do the two hip hop songs that follow - "Peacemaker" and "Once More," from the original Schism. "We Are The Never Ending Story" is a straight drum and bass track with some of Huang's signature cryptic lyrics ("We are the never ending story, crawling into this star stomach." I'm not sure what that means, but the track is still pretty solid). "Caustic" comes next, followed by "Tape/Brazil," which is another hip hop track with a jungle beat that Huang proceeds to rap over. It's a bit of a broken flow, but it sounds good paired up with the music; there's something about the end that I really like. He sings through it instead of rapping, and the beat slows down quite a bit, with some 8-bit synth sounds added. "22" is an interlude that leads right into "Ursula," which is a very catchy dance track. It's definitely one of my favorite ones here. A musical favorite is the next track, "Pent Up." While I am again uncertain as to what some of his lyrics mean here as well ("This guy could talk me into a circle, talk me into a circle or a cube"), the music is pretty intense (as far as electronic music goes). It's a little hard to describe, but it's fantastic, and I could listen to it all day. The final track is "Destroy The World." It's a slower song, with the first verse reminding me of something you might hear on Listener's album Whispermoon. The track becomes a bit more layered as it goes on, and the second verse picks up a little more in the flow. It's not my favorite track of the album, but it's a decent way to end Schism. Ever since Huang released a music video for "Peacemaker" back on January 1, 2011, I knew I'd be stoked for whatever album it was going to be on. When the Schism EP originally released, I listened to it constantly. And I love that it was one of the albums that he chose to re-release and pump up for this new re-branding of his music. He's a very talented musician, singer and emcee, and the name change seems like it has him going in the right direction. Check out the new Schism on his new Bandcamp page, and get a dose of some excellent electronic hip hop.